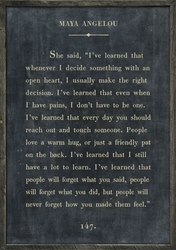 She said, "I've learned that whenever I decide something with an open heart, I usually make the right decision. 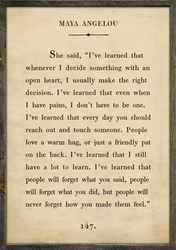 I've learned that even when I have pains, I don't have to be one. 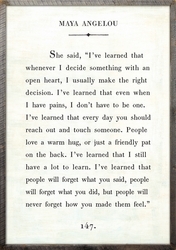 I've learned that every day you should reach out and touch someone. People love a warm hug, or just a friendly pat on the back. I've learned that I still have a lot to learn. I've learned that people will forget what you said, people will forget what you did, but people will never forget how you made them feel."